전문분야 대학에서 심리학전공하시고, Counseling 석사를 전공하셨고 현재 미국 Nebraska에 살고 계시는 선생님으로 비지니스영어, 잡인터뷰 준비, 성인일반회화 중점적으로 잘 지도하여 주시는 밝고 유쾌한 선생님이십니다. 엔토 매니저님! Kimberly M. 선생님은 어떤 분이신가요? I majored in Psychology here in the USA and acquired a Master's of Science degree in Counseling here in Nebraska where I live. 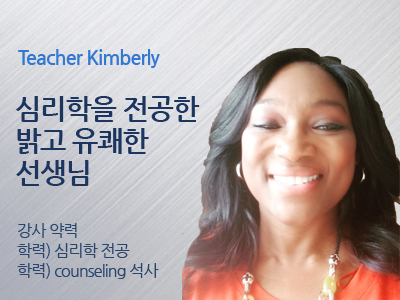 저는 미국에 있는 대학에서 심리학을 전공했고, 현재 제가 살고 있는 Nebraska 에서 Counseling 석사를 전공하였습니다. I enjoy diversity and learning about different cultures. I believe learning has two components: teaching and learning. I believe the teacher and the student are both responsible for both. 저는 다양성을 좋아하고, 다양한 다른 문화를 배우는것이 즐겁습니다. 저는 배움에는 두가지 요소가 있다고 생각합니다. Teaching 그리고 learning 입니다. 선생님과 학생 둘다에게 책임이 있다고 생각하기 때문입니다. I am so looking forward to talking with you about Korea, your interests, jobs, etc. and teaching you English. There is so much we can explore together. Hope to see you in my classroom at NIL English real soon. 저는 여러분과 한국에 대하여 그리고, 여러분의 관심사, 직장에 대하여 이야기 하고, 영어를 가르치기를 고대합니다. 함께 많은것을 이야기하고 서로 알아보아요. 곧 만나기를 희망합니다.